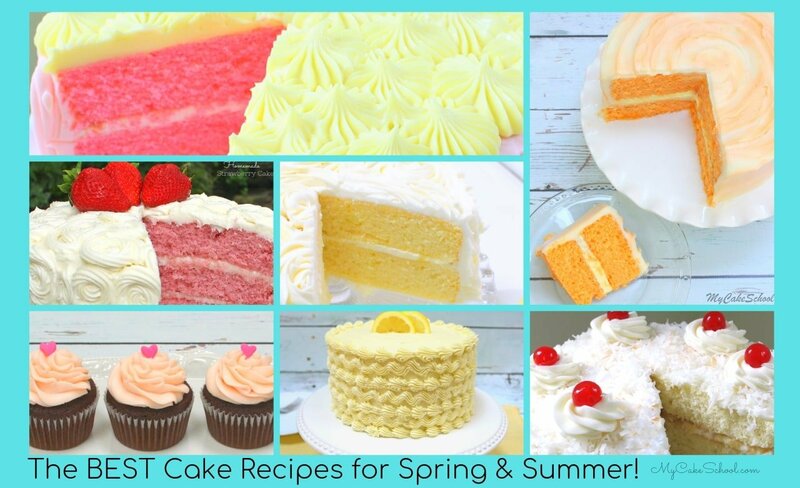 Spring is in the air and it’s time for a delicious roundup of the BEST cake recipes for spring & summer! 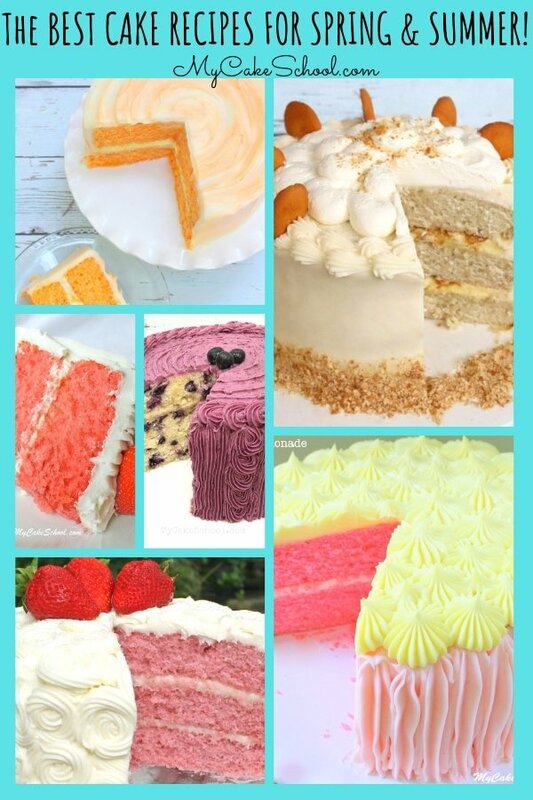 A great slice of cake is going to be delicious no matter what the season, but in warm spring and summer months, I especially crave cakes with refreshing fruit flavors or an extra pop of color! You may have seen our roundup of our favorite Summer Cake Designs, Tutorials, and Inspiration, but today, we’re all about the RECIPES! We have SO many favorite recipes for spring and summer that it would be impossible to pick just one. Whether you’re looking for citrus cakes, cocktail inspired cakes, or fruit flavors that pair wonderfully with chocolate (hello raspberry, strawberry, and coconut), we have something for you! Save this roundup for the next time you’re planning a birthday party, neighborhood gathering, or just a fun night with the family. We hope that you find something that you can’t wait to try! Enjoy! We love these light and fruity cake recipes for spring and summer gatherings! All the wonderful flavor of banana pudding in cake form! We love this amazing recipe with it's moist banana cake layers filled with vanilla wafers, bananas, and vanilla cream, and frosted in cream cheese frosting! SO good! Piña Colada Cake should be the official party cake of summer! I love the combination of coconut and pineapple (with a hint of rum)! So perfectly moist and delicious! Pink Lemonade Cake tastes like a slice of summer! The slight tartness of lemony flavor is perfectly balanced with just the right amount of sweetness...not to mention a heavenly lemon cream cheese frosting! This classic strawberry cake is super moist and bursting with flavor! Everybody needs a GOOD homemade strawberry cake- this is the recipe! Homemade margarita cake! This moist lemon-lime layer cake with tequila lime buttercream is fantastic! This sophisticated Champagne and Strawberries Cake is amazingly moist and flavorful! It has just the right balance of strawberries and champagne! This Lemon Pound Cake recipe is so moist and bursting with lemon flavor! It tastes like springtime! Oh how I love pound cake, and this combination of raspberry & lemon is perfection! So much flavor! I love lemon cakes! This cake mix version is so easy and fast to make! Delicious Lime Layer Cake from Scratch with Lime Curd Filling! Oh so good and perfect for spring and summer celebrating! This super moist and flavorful homemade banana cake is sure to be a crowd pleaser no matter what the season! Everybody loves margaritas- especially in the form of a layer cake! This easy and flavorful cake mix version tastes amazing. Look for our scratch margarita cake too! Cherry Chocolate Chip cake is one of our most popular fruity cake recipes! I love the addition of the mini chocolate chips- chocolate and cherry flavors are perfect together! This southern classic cake recipe has a wonderful blend of banana, crushed pineapple, and a hint of cinnamon! You don't even need your mixer for this one! Easy and delicious. This moist and flavorful Cherry Cake from Scratch is one of our favorites! Keep it in mind for spring and summer gatherings! White chocolate and raspberry- ahhhh so good together! We love this moist and fruity cake for spring and summer entertaining! This decadent devil's food cake is perfect with our raspberry frosting and a fantastic chocolate drip. So dramatic and beautiful! Pink Champagne Cake is the perfect cake for any special occasion! You really can taste the pink champagne- just the right amount of flavor! This Pineapple Cake Recipe is the best! Moist yellow cake layers with a luscious Pineapple & Cream Filling! This cake tastes EXACTLY like an orange dreamsicle! Such wonderful flavor- moist orange cake layers, orange cream filling, and orange cream cheese frosting! Heavenly! A quick and easy version of Pink Champagne Cake- still equally as delicious and sophisticated as our scratch recipe. Try them both! We've been making this pound cake in my family for years! Always a favorite, and I love the hint of lemon! Strawberry and Lemon cake (or Strawberry Lemonade Cake) has a wonderful flavor combination for summer months! So uniquely refreshing! Everyone loves chocolate covered strawberries, especially when it's in cake form! You'll love this moist strawberry cake with rich ganache! This Almond Joy Cake is amazing! Decadent chocolate cake layers with a thick and flavorful coconut filling, frosted in rich ganache. Lemon and Blueberry! Such an amazing flavor combination, and you'll love the dreamy blueberry frosting too! This is the BEST Carrot Cake Recipe! It is so moist, and bursting with wonderful flavor from carrots, pineapple, coconut, nuts, and spices! If you've been searching for an amazing classic carrot cake recipe, this is the one! This Lemon Orange Layer cake has wonderful citrus flavor! Lemon cake layers are filled with orange curd and frosted with orange cream cheese frosting! SO good! This moist and flavorful Pineapple Coconut Cake consists of homemade pineapple cake layers with a delicious pineapple filling and coconut cream cheese frosting! Thanks for stopping by! We hope that you enjoyed this roundup of spring and summer cakes (which, as it turns out, doubles as a post of our favorite cakes with fruit!) If you try any of these recipes, we’d love to hear what you think! make sure to leave a comment below. More Delicious Cake & Frosting Recipes! You can find our full collection of FAVORITE recipes for both scratch and cake-mix cakes in our Recipes Section, along with tons of amazing frosting and filling recipes to pair them with! Let us teach you How to Decorate Cakes! If you are interested in cake decorating, you must check out our Free Cake Tutorials section, which also features a Free Cake Decorating Videos category- So many fun & easy ideas! If you’d like to learn even more about cake decorating, please consider joining My Cake School! As a member, you’ll have access to every cake video tutorial we’ve made (hundreds!) for all skill levels of cake decorating. We’d love to have you! You can find all of the details here: MyCakeSchool.com Membership Information- Learn Cake Decorating Online!